A spectacularly dark mixture of noir and horror, much like Ulmer’s previous film The Black Cat (1934), Bluebeard is a revenge story. 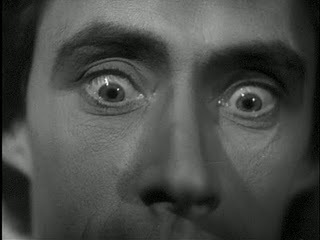 John Carradine plays Gaston Morrell (aka “Bluebeard”) in one of his rare leading male roles, an artist so scarred by the revelation that his ultimate muse is a “loathsome creative” that he kills her. This woman, whom he had rescued and nursed back to health after an accident, was the source of what he believed to be his greatest achievement in painting. After her murder, Gaston becomes fundamentally broken. Unable to escape the pain she had inflicted, whomever else he painted turned into a representation of her…and so he killed them too. She continually haunted him, controlling his downward spiral in artistic practice, ability to love, and mental stability. While we don’t find out these plot points until the end of the film, we do know from the start that Gaston is “Bluebeard” and that the three women he meets on the street in the first scene should be wary. 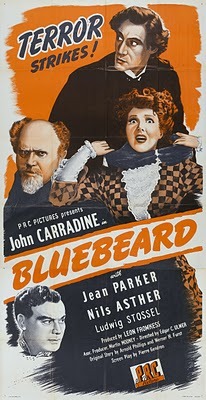 Bluebeard is one of the many adaptations of the French folktale “Bluebeard” by Charles Perrault (1697) in which a man with, naturally, a blue beard would test his new wife by telling them not to look in a secret room while he was out of town. Filled with curiosity, each one defied him by accessing this room only to discover the bodies of all Bluebeard’s previous wives dead and hanging on hooks. This original version (thought to be inspired by Gilles de Rais) doesn’t include any artistic endeavors but certainly captures the same sense of mistrust with women as the film does. To add to this, Bluebeard is set in 19th century France but strongly recalls the 19th century London’s Jack the Ripper who mysteriously murdered five woman (mostly prostitutes) in 1888. While coming to grips with his limitations to produce a painting of true original beauty, Gaston is damned to repeat the same mistake over and over again. He attempts to avoid this failure by concentrating on carving marionettes and producing a puppet opera in the park for a living (shown in another stunning scene in which Ulmer re-creates Faust). But despite his murdering tendencies, we tend to sympathize with his plight especially when we see him trying so hard not to harm his new love Lucille (Jean Parker) by insisting that he never paint her. However, Lucille can’t help but feel this as a rejection of his affection rather than an affirmation of it. 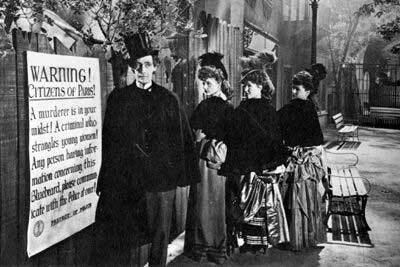 For beautiful women in Ulmer’s Paris being a muse is a full-time job as shown in the police investigation scene, women employed as muses are lined up to give testimony as to whether or not they know Bluebeard. 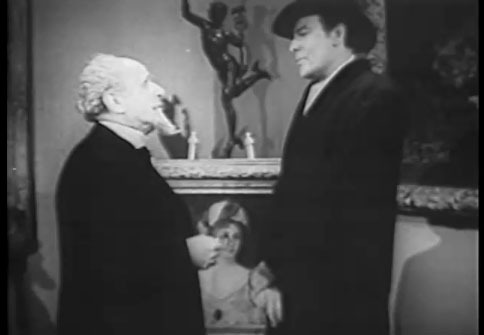 The true villain in Bluebeard is actually Gaston’s art dealer, Jean Lamarte (Ludwig Stössel). It seems inescapable for dealers to be portrayed as anything other than money-grubbing hucksters (ala Crucible of Terror) and the character of Lamarte certainly holds up this stereotype. With a single purpose to make money, he cheats his artists out of a fair percentage (he lies to Gaston about how much he’s selling his paintings for) and continues to pressure the artist to produce artwork even though he is fully aware that a woman will likely be killed. It’s this awareness without conscious that makes him truly evil. While Gaston may be the murderer, he is also a victim with a conscious. And it’s Larmarte’s insatiable greed leads to everyone’s downfall: unable to resist the money offered to him, he unknowingly arranges a portrait session with police detectives. 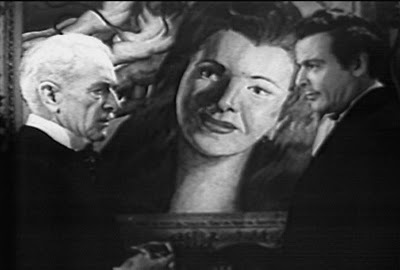 While the act of painting is Gaston’s psychological undoing, it is the resulting painting as object that is his literal undoing; he is tracked down by Inspector Lefevre (Nils Asther) when a notable collector’s painting is discovered to resemble a recently murdered woman. 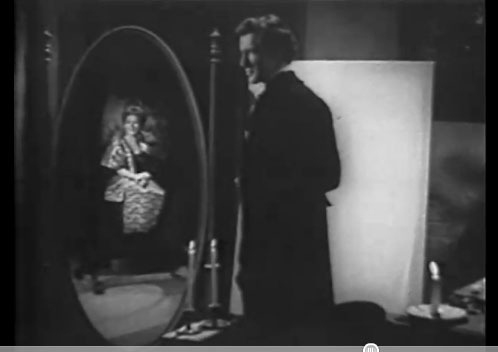 This undoing is played out in one of the most visually styled scenes in the film: Gaston agrees to paint the portrait of a young South American heiress despite his reservations. He innately feels something is wrong and with good reason, the woman is actually a part-time detective and Lucille’s sister Francine, so he constructs his studio so that he cannot be seen. In a stunning shot, we see the back of Gaston and the reflection of the sitter in a mirror. He is completely hidden from her but she is revealed to him while our perspective sees everything. As previously mentioned in the post on Profondo Rosso, the mirror acts as a doubling agent inserting and reflecting subject matter. In Bluebeard we can sense her fear, his hesitation, all within the act of portraiture. Here identity is truly subverted. The notion of Gaston’s failure to produce the work he wanted could have been used as a more progressive subject rather than a finite disaster. Curator Lisa Le Feuvre re-addresses failure in the context of today: “not only to draw on melancholic radical doubt, but to embrace possibility in the gap between intention and realisation”. Gaston did not embrace this gap. Instead his psychotic impulsiveness drove him into pure physical reaction rather than internal contemplation. From his intention to create an ideal work of art to the formalized realization that it depicted a hateful ghost of a woman, he only embraced eliminating the failure. Because of this, the never found the success he so craved in art and love.